At Wahee-gama each and every piece is handmade with the utmost care and attention. 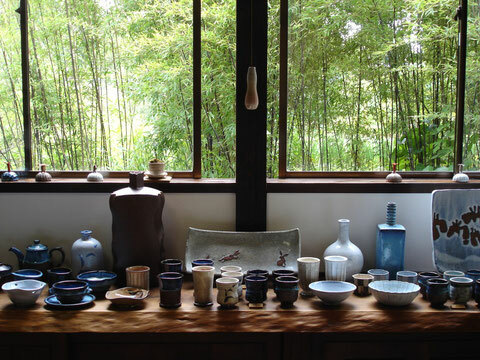 We believe it is possible to use traditional methods to produce pottery suited to modern living. The beautiful Namako-yu glaze is the main characteristic of Shiraiwa-yaki ware, and it gives its gradating blue and white appearance. As Shiraiwa-yaki ware had at once time ceased production, much lengthy research was necessary to reproduce the glaze. At last we found the correct tones of the glaze, produced using natural materials from local sources, and devised the best process of firing. We use a multi-chambered climbing kiln and a kerosene kiln to make our wares. It is more difficult to control the temperature of these than it is control the temperature of electric or gas-fueled kilns, but we keep on producing Shiraiwa-yaki pottery with them. We believe that the very best and most beautiful results can only be achieved by using traditional methods. Namako-yu glaze is also a traditional, and a unique, glaze. With our time-honored method and glaze, we at Wahee-gama never stop pursuing our goal of matching our traditional and beautiful pottery with modern life styles. Akita Prefecture is a cold region, where it snows almost one third of the year. The soil and the glaze are frozen in wintertime. Living here means we have to share our lives with severe nature, and that making pottery pieces is done less efficiently than in warmer areas. In the depth of winter, we are quite isolated from the outside world. Taking time for creative pursuits gives us pleasure, and makes winter pass more quickly. We think that the blue and white color of Namako-yu glaze represents snow, and that color of the clay represents the color of slushy ground as the snow melts. Shiraiwa-yaki ware expresses the delight of the people as they welcome the warmth of springs, after the long coldness of winter. Our style goes against the trends of modern society, in which people tend to value efficiency above everything else. At Wahee-gama we believe that fine works of surpassing beauty can only be created with a great deal of time and effort.